Luxury river cruise adventures company, Pandaw, has announced a new 7-day programme through the tranquil 'Backwaters of Kerala'. The late 2015 and early 2016 itineraries will offer Pandaw guests an in-depth exploration of this lush, green, southern Indian landscape, which boasts over 40 waterways, churches, temples and rich exotic life such as kingfishers, otters and turtles. "Pandaw was one of the founders of river cruising in India and we are now delighted to offer this combined cruise and land package, exploring some of the most fascinating and historically-interesting waterways in the world." A three-night land programme with guests staying at the 5* Heritage Vivanta by Taj Malabar Hotel, Cochin. Visits to Fort Cochin, believed to be the oldest settlement in India, St. Francis church and the Dutch Palace which features mythological murals and traditional Keralite flooring. 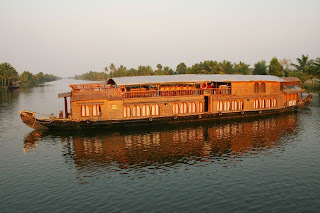 A three-night cruise aboard MV Vaikundam, the only wooden boat to boast 9 bedrooms with premium five-star facilities, from Thottapally through Kanjipada, before sailing on to Champakkulam village. Excursions comprising a scenic walk through picturesque villages, a canoe ride, fishing and an opportunity to explore the local Cochin spice market with a chef to learn about the spices of Kerala. Join MV Vaikundam on a 6-night programme, including 3-nights at the 5* Heritage Vivanta by Taj Hotel, with 3 breakfasts and one dinner, excursions as described, entrance fees, port dues, govt tax, porterage, guide services (English language), 3-night cruise on the MV Vaikundam on a full board basis, jugged coffee, selection of teas, mineral water. Transfers between Cochin and MV Vaikundam before and after your cruise, services of a local representative and cruise director. Cruise Price Excludes: International flights, laundry, all visa costs, drinks, fuel surcharges (see terms and conditions), espressos and cappuccinos at bar, tips. There are 4 sailings scheduled for 2 December 2015, 12 January 2016, 23 February 2016 and 22 March 2016, priced from USD 1530.-, based on two people sharing a twin room/cabin 2 December 2015 package.